The floor isn't just for walking on anymore! In warehouses, the floor offers great opportunities for improving visual communications through the use of floor markings. While floor markings have been used for many years, companies are now using them in new and innovative ways that are far more thought out than in the past. When done properly, floor markings can be useful for people at every level of a company. It is important, however, to really think through how floor markings should be used in a facility. If they are applied without a good strategy, they can actually cause more problems than they fix. 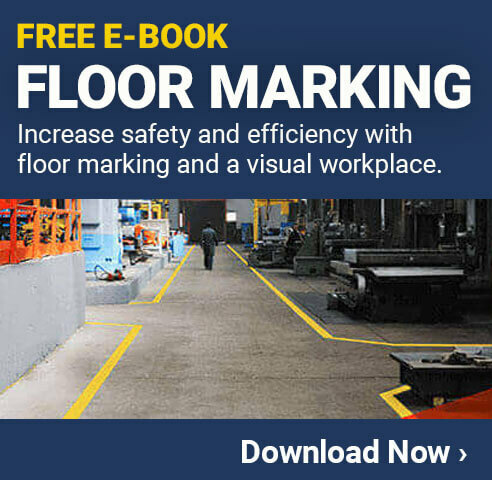 With this in mind, all facility managers should look at floor marking ideas for warehouses and determine which ones will work best for their needs. Floor markings are any type of marking that goes on the floor. In warehouses they are commonly used to improve safety, efficiency, organization, and more. The first step in any good floor marking strategy is learning about the different types of floor markings available and what they are good for. In most cases, a facility will use more than one type of floor marking to accomplish its specific goals. Different types of floor markings are best for use in different areas. Having a properly considered strategy for what to use and where can help ensure the floor markings will provide the needed results. Another thing many companies like about floor marking tape is its affordability. Companies can use this type of floor marking throughout the warehouse without breaking their budget. It is easy to install and can even be removed without much trouble if needed. All these perks have helped make floor marking tape an extremely popular option in warehouses around the world. Normal Floor Marking Tape - This tape comes in a large roll that can be applied in straight lines. It can be put down by hand or using an applicator to speed up the process. This is a great option for aisle ways and other long, straight lines. Floor Marking Shapes - Floor marking shapes come in a variety of types including dots, footprints, and arrows. 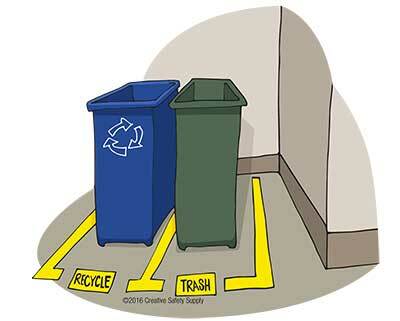 Having a large circle, for example, can be used to indicate where a trash bin should be placed. Arrows and footprints can direct people during an evacuation or instruct them to travel one way down a particular aisle. Colored Floor Markings - A tape's color can change its meaning. An aisle with red tape, for example, could indicate the items found there are flammable. There are many ways different colors of floor tape can be used, depending on a warehouse's needs. Reflective - Reflective floor marking tape reflects light back at its source. This is a great option for use in areas where indoor vehicles with headlights are used. It can also be used outside at night to improve visibility. Glow-in-the-Dark Tape - For areas where lights are bright sometimes and dim other times, glow-in-the-dark tape is a great option. This tape absorbs light energy while it is bright out and then emits a visible glow when it is dark. This is an excellent option for use during power outages or other potentially dangerous events. Floor marking paint can be applied directly to the floor of a facility. This type of paint has been used in warehouses for years and is often ineffective. It is more time consuming to apply than tape since it needs to dry, and the installation process in general is somewhat more difficult. It can also be difficult to apply when custom shapes or designs are needed. Unlike like floor marking tape, floor marking paint can be very costly. One of the common problems with floor marking paint is it chips and peels easily when vehicles ride over it, and then it needs to be reapplied. 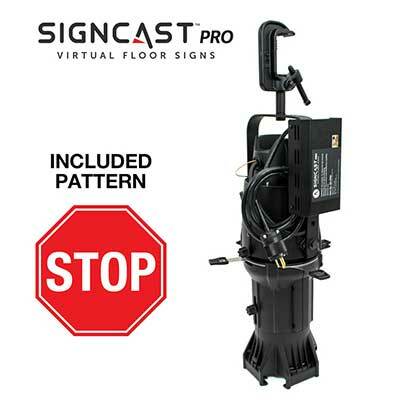 Advanced floor marking light systems can be set up to display any image, including words, signs, and shapes. This makes this floor marking method one of the most flexible options available. Many facilities have one or two floor marking light systems to compliment the rest of their permanent floor marking strategy. One of the most important ways to use floor markings in a warehouse is for improving safety. Floor markings are intended to be highly visible, so they can get people's attention when other options aren't effective. Using floor marking arrows, for example, can help ensure that all the indoor vehicle traffic travels in the same direction down an aisle. This can minimize the risk of accidents between vehicles and can also alert pedestrians to the fact that vehicles may be traveling through. Facilities can use different colors or patterns for their floor markings to improve safety as well. As long as the strategy for improving safety using floor markings is well thought out and documented, it can be extremely effective. Even companies that have been using floor markings for years find the safety benefits continue to exist long after employees have gotten used to seeing the markings. People see the markings and somewhat subconsciously understand the safety message. One of the most important ways floor markings can be used to improve safety is by identifying evacuation routes. Having floor marking arrows of a specific color always pointing in the direction of the nearest emergency exit can be very helpful. Some facilities even use glow-in-the-dark tape so that if the power goes out during a fire or other emergency, employees will be able to more easily find their way out of the facility. When using floor markings to identify evacuation routes, it is important to ensure that the markings are easily distinguished from all other floor markings. Whether this is done using specific shapes, colors, or types of markings, choose one option and use it throughout the facility. Improving the efficiency of a facility is extremely important. A warehouse that runs efficiently is more profitable, which is the end goal of any business. When employees waste their time trying to get things done inefficiently, it costs the company money. Floor markings that identify the steps a particular item needs to go through can be helpful. When something enters the facility, it may need to be checked in by the receivables department. This could be marked with a number one on the floor of the area. The next area may label the item with a bar code or RFID tag, and that station can be marked with a two. This process can go on until the item is placed on the shelves or even shipped back out. Using floor markings to make sure all employees know exactly where things are coming from and where they need to go will help avoid wasted time. It can also make it easier for the floor supervisors to ensure employees are always productive and not just walking around looking busy. All warehouse owners know that using numbered aisle signs can be helpful for identifying where items are stored. Floor markings can really take that concept to the next level. To start with, many facilities will use floor markings to apply the aisle number at each end of an aisle so that it is easily visible. These markings can then be used to place letters or other symbols along each section of the aisle to break it up further and make it easier to locate items. Since the floor markings are applied directly to the floor, they are easy to see while still being completely out of the way. Hanging signs can either be hard to see or get in the way of the upper shelving. There are many business strategies popular in manufacturing and warehouse facilities. Many of the strategies were created by the Toyota Motor Company and have grown or been adapted to use in many other facilities. 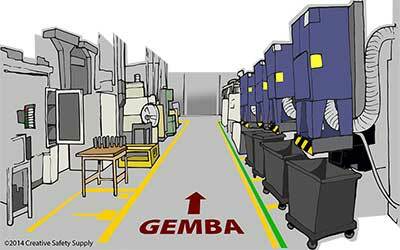 Gemba Walks - Floor markings can help identify the different work areas within the warehouse. Knowing where to go on a gemba walk can ensure no areas are missed and that the person doing the walks accomplishes what they set out to do. 5S - The 5S methodology is all about improving organization and eliminating all types of waste from the facility. Floor markings can help accomplish this goal in many ways. Reducing wasted time by guiding people to where they need to go and improving safety are just two of the ways floor markings can be used for 5S. Lean - Lean is another effective waste elimination strategy used in warehouses and other facilities. Applying floor markings to identify work areas and provide insights about how to follow established procedures can be very effective. There are many other business improvement strategies out there, and just about all of them can benefit from proper use of floor markings. Any facility thinking of implementing this type of strategy should look at how floor markings can help accomplish those goals.